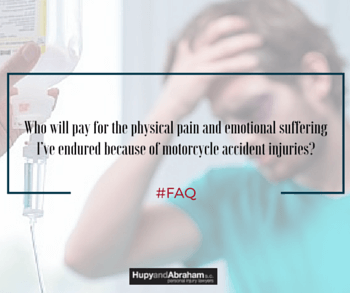 Recovering for Pain and Suffering After a Motorcycle Crash | Hupy and Abraham, S.C. The physical pain and emotional suffering that result from motorcycle accident injuries may be the most significant damages that you suffer. While the medical bills add up and the lost income presents a financial burden, it is the day-to-day physical and emotional pain that truly changes your quality of life, your enjoyment of life, and your ability to live your life. However, if you fail to take action, then you will be the only one to pay for your pain and suffering. Instead of bearing this burden, motorcycle accident victims should know that their pain and suffering can be a significant part of their damage award if someone else caused their accident. While you can’t shift your physical pain or emotional suffering to someone else, you can receive financial compensation for these damages, and an experienced attorney can help you make sure that your recovery is fair. A feeling of disconnection from the accident. Denial that the accident occurred. Just a few of these symptoms can change your life and leave you unable to spend quality time with your family, work, or enjoy your leisure activities. The value of these damages may be hotly contested during motorcycle accident settlement talks or in court. However, an experienced attorney can provide the right documentation and make convincing arguments to get you the recovery that you deserve. To learn more about how to protect your rights and your recovery, please contact us today via this website or by phone at 1-800-800-5678.